This picture was clicked during one of my trip to Bannerghatta Nation Park. Bannerghatta National Park is situated near Bangalore, Karnataka, was founded in 1970. The park has a zoo, animal rescue center, a butterfly park, Aquarium, Snake House and a safari park. You may think that what is so special about this monkey that I am posting its photo on my website. But do you know that these species of the monkey who are commonly known as Old world monkey they are the most expressive animals, Like Humans. Also, these species are listed as least concern in the Red list of threatened species of the animals around the globe. Although I went to Bannerghatta to see and capture pictures of some of the rarest of rare spices of animals like white tiger, spotted deer, wild boar etc. This monkey caught my attention as it was attentively staring at its baby while the baby played carelessly knowing that he is being watched and he is safe. 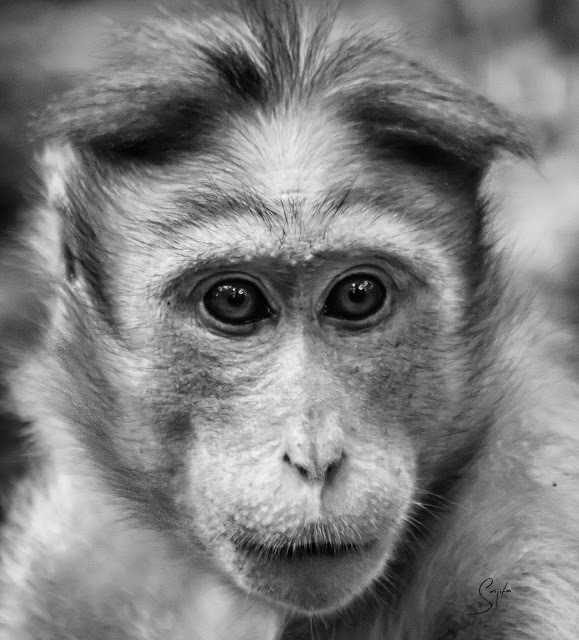 The more I observed this Mumma Monkey, the more I was able to relate its behavior with that of humans. And then I realized, the word "Mother" is not just a title that we give to some female, it is more of an emotion that could not be categorized on the basis of species, region, race etc. And that is why this Staring Mom is getting a special place on my website as a blog entry.